Although startups based in California, New York, and Massachusetts have traditionally accounted for the majority of VC tech investment activity in the United States, VCs are spurring other hotbeds of innovation across the country. With this in mind, we used CB Insights data to analyze the most active venture capital firm, by the number of investments into tech startups, in each US state from 2012 to 2017 year-to-date (through 5/17/17). We based our selection on investments into unique tech companies in each state (not counting multiple rounds to the same company). We excluded debt deals, and only considered venture capital, corporate venture capital, super angel, and growth equity firms. When there was a tie across multiple VCs in one state, we used recency of deals, overall deal activity, and investor quality to select the most active tech startup investor for that state. There were various top VCs (aka smart money VCs) making their mark on the map. 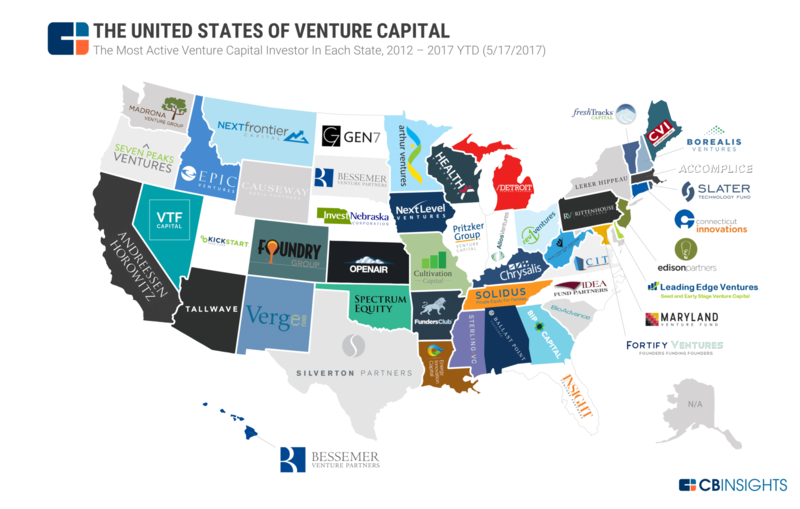 For example, Andreessen Horowitz (a16z) was the most active investor into California tech startups, Foundry Group was the most active investor into Colorado, and Bessemer Venture Partners into South Dakota. There was just one investor that was the most active VC into more than one state: smart money investor Bessemer Venture Partners was the most active investor into South Dakota and Hawaii. From when we last conducted and published this analysis in May 2016, there have been a number of changes among the list of most active VCs. Most notably, a16z overtook SV Angel as the most active VC into California, although the two firms were still close in absolute terms. Additionally, Accomplice edged past General Catalyst Partners as the most active VC into Massachusetts. Note: The most active VC into Texas, Austin Ventures, failed to raise an eleventh fund and wound down its operations. We have instead featured the next most-active VC into the state, Silverton Partners, in the map below.